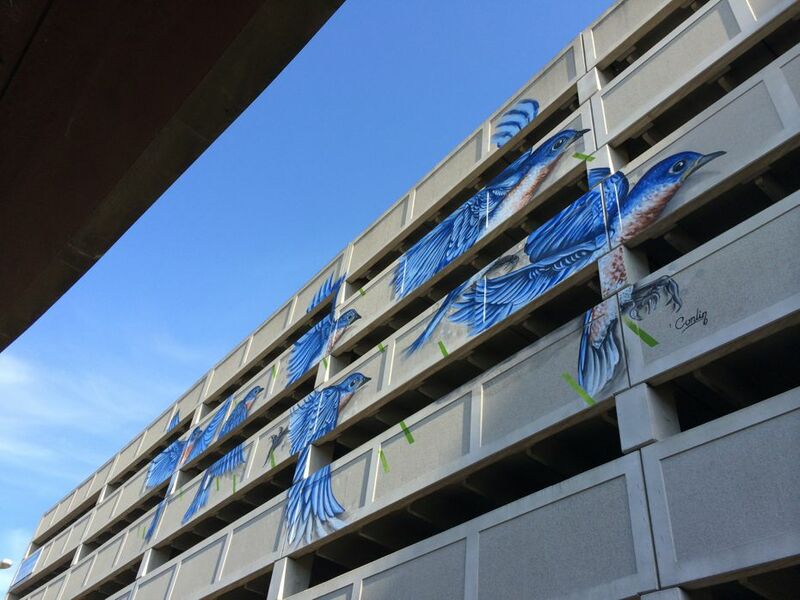 We stopped by the Quackenbush Parking Garage in downtown Albany Tuesday to see large mural that artist Michael Conlin recently completed there. There are a handful of large photos after the jump if you'd like to have a look. 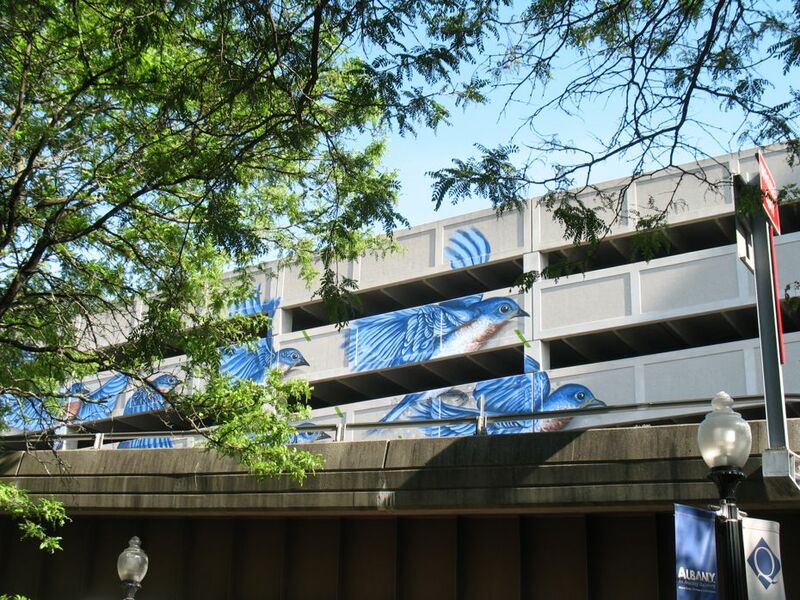 The mural -- which is roughly 25 feet by 85 feet -- is part of an effort by the Albany Parking Authority to make its garages more welcoming. 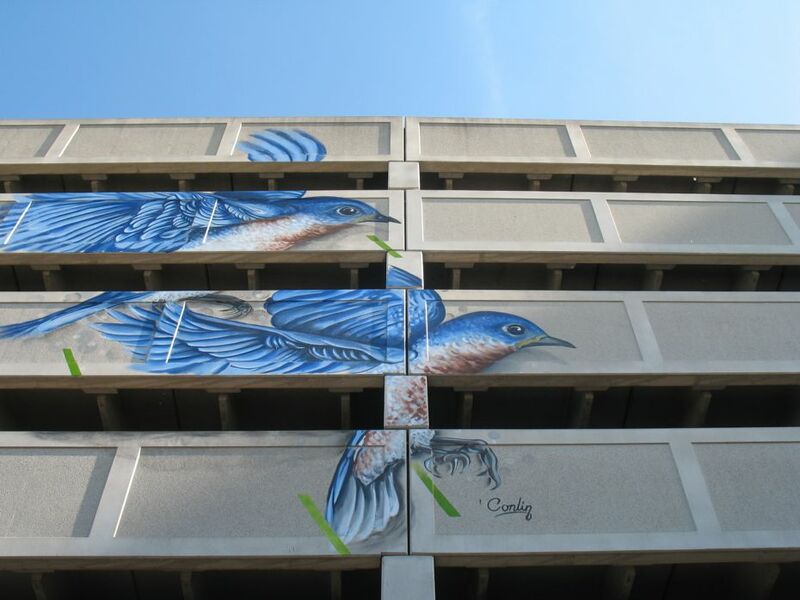 The art is the result of a collaboration between Conlin and a handful of local orgs, including the Albany Center Gallery. 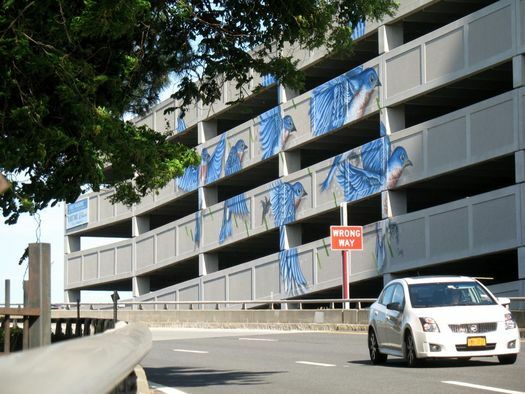 City officials have also said the mural's site -- along the Clinton Ave off-ramp from 787 -- also means it can also double as a way of welcoming people to the city. 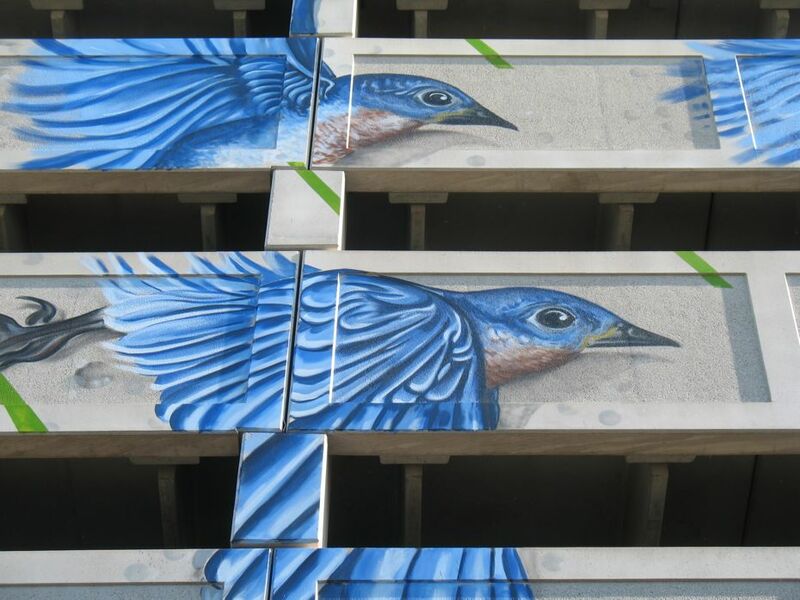 The mural depicts a group of Eastern Bluebirds (the state bird of New York) flocking toward downtown. 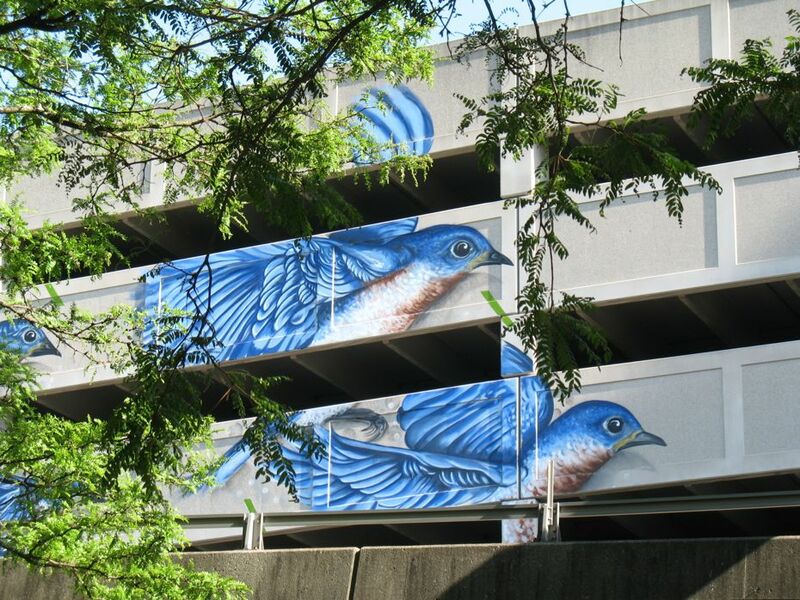 Note to sad members of Albany Parking Authority who want to make garages more appealing.......MAKE THEM MORE APPEALING!!!! ......don't build such crap....pig on a lipstick is still a pig....cute birds though! Maybe I am missing something.. But what is the fundamental difference between such mural and graffiti? It would be immensely more appealing if the Quackenbush Garage were FREE on weekends and evenings, considering the downtown neighborhood is a desolate wasteland during those time periods. This guy sure is a talented painter. 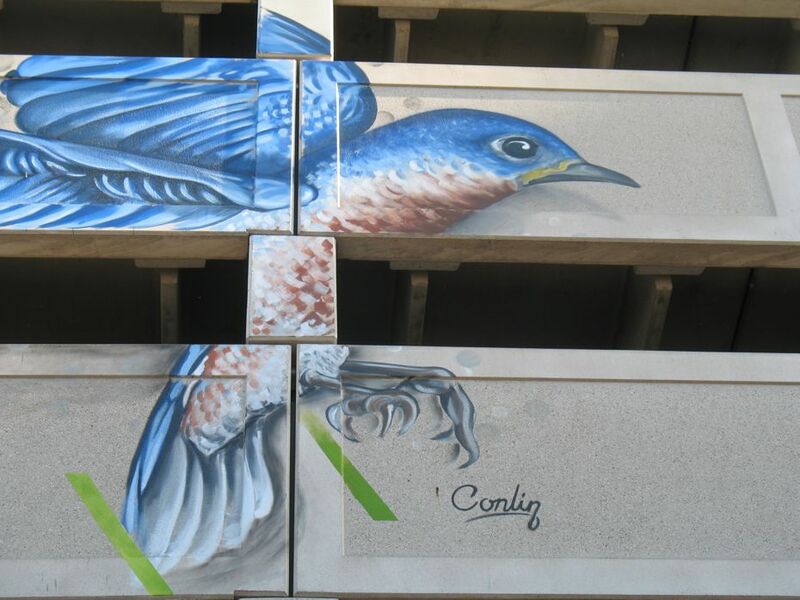 I would have like to see the birds spread out a little more and maybe had them at different sizes to give the completed piece additional depth though. @Mike the difference is that this artist had permission and was even paid (as he should be) to do painting on a building. Beautiful! It has me noticing at all the other monolithic structures around the area that could serve as canvasses for similar projects. 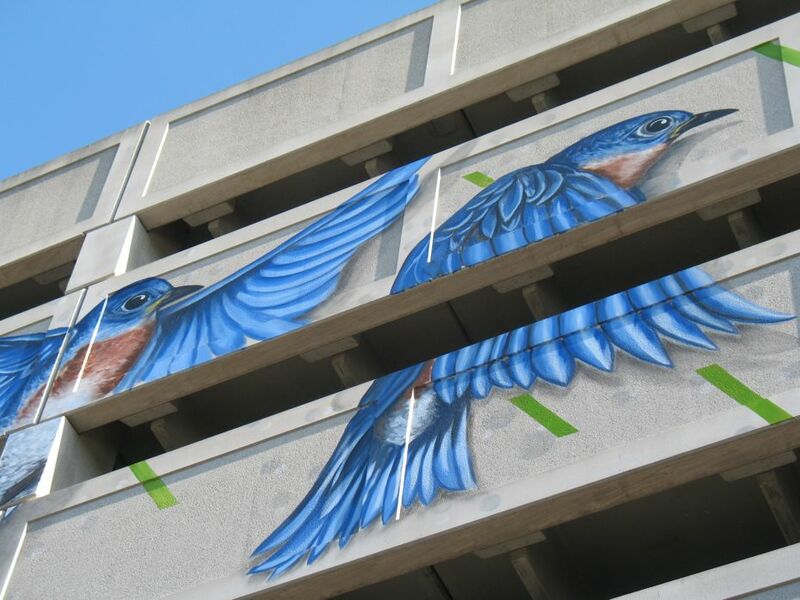 Maybe a local artists guild could start a crowdsourcing page for similar projects? I'd hope some building owners would be interested in donating walls if the work was paid for. 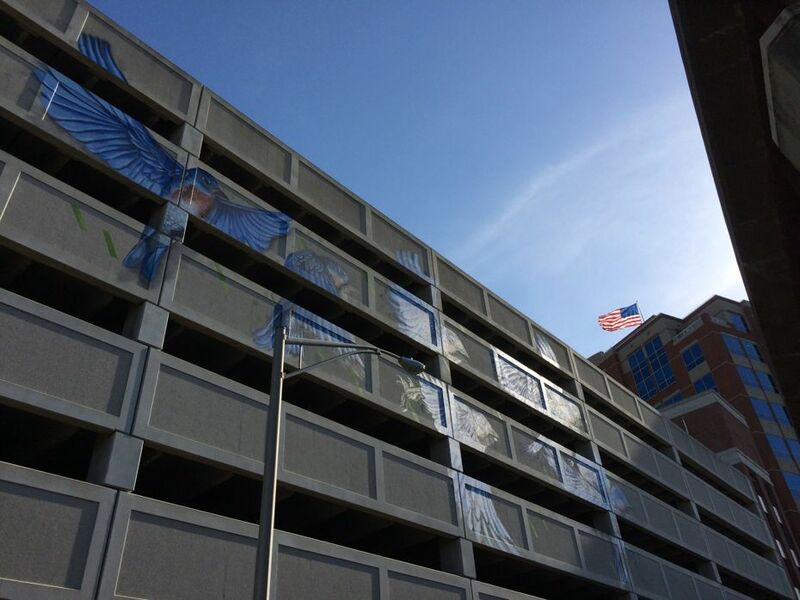 @Mike, I think the fundamental difference between a mural and graffiti is a legalistic one. A mural is often done with permission by the property owner, while graffiti is done irrespective of approval. Obviously, some gray areas there (some cities will sanction "graffiti" on abandon properties where ownership is ambiguous, contested or unknown in an effort to beautify blight). At the end of the day, all street art, whether condoned or done in spite of the law, is open to interpretation. This is simply gorgeous. Congrats to Michael C. and the others that made this happen! I drove by while he was painting. I think it came out amazing and Albany BID should pursue additional opportunities. 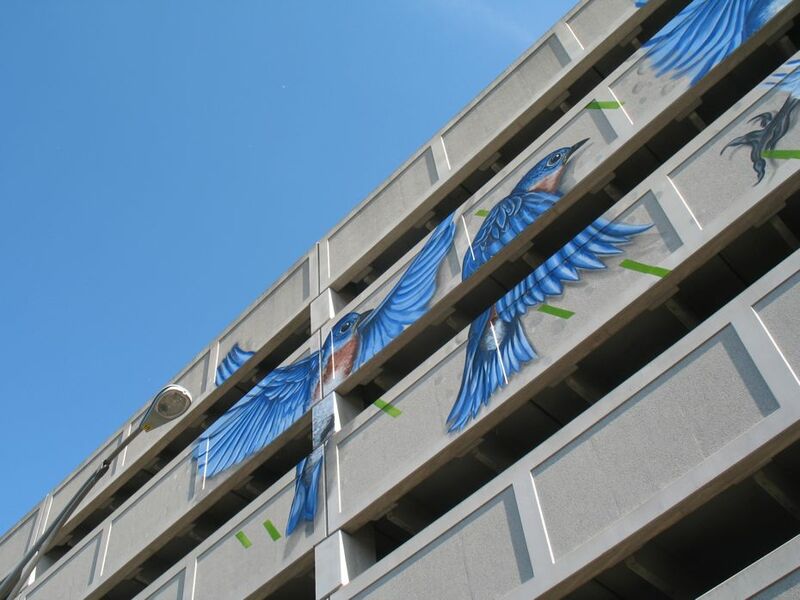 What I was thinking about - what if someone gets inspired by the mural (and that is common claim about graffiti - it brings more graffiti) and paints, say, central eyesore. Without permission. What would be city reaction? And public feedback? Mike, have you looked at "Central Eyesore" in the last, say, ten years? It already has plenty of graffiti. Living Walls has been around for about half that time and hasn't inspired anyone to do anything similar on the warehouse. You want to? Go for it, and maybe cut down the trees growing on the roof while you're at it. Mike, if it was decently done, I would personally welcome more graffiti on the cold storage building. Your first comment brought to mind the incredible graffiti that lines the concrete parts of parks I've been to in Europe, Ljubljana especially. One of the great things about public art is it doesn't need to be sanctioned or even close to legal for it to contribute great things to the public realm. Wow - that came out much nicer than I expected!